We’d love your help. Let us know what’s wrong with this preview of Fortune's Fool by Josh Vogt. Waking up chained to a poker table in the middle of a warehouse, abnorm Ryan Emerson finds himself in the company of nine other unwilling players—all of them abducted twists with unique talents. 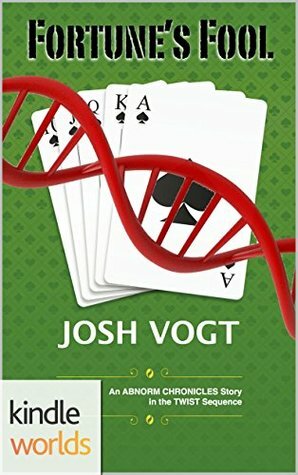 Forced into a deadly game of Texas Hold ‘Em, Ryan must use all his wits to survive as many hands as possible; the instant his last chip is lost, so is his life. Yet what could thei Waking up chained to a poker table in the middle of a warehouse, abnorm Ryan Emerson finds himself in the company of nine other unwilling players—all of them abducted twists with unique talents. Forced into a deadly game of Texas Hold ‘Em, Ryan must use all his wits to survive as many hands as possible; the instant his last chip is lost, so is his life. Yet what could their self-proclaimed genius of a captor possibly gain from such an insane setup? To ask other readers questions about Fortune's Fool, please sign up.